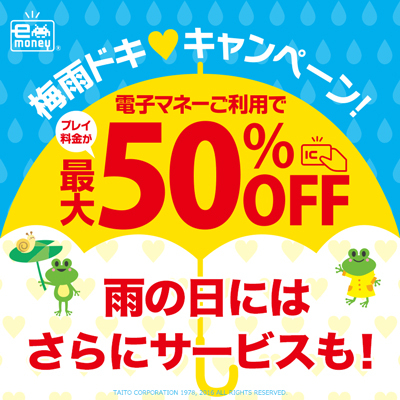 TAITO CorporationUp to 50% discount! We are entering a rainy season in Japan which we call "TSUYU". During "TSUYU" we offer a special price discount campaign at TAITO STATION. Discounts will be applied when you use electronic money cards for charges, up to maximum 50% of the game charge depending on types of games. This campaign will be held until " July. 14". See you at TAITO STATION !